As many of you know I have been battling the lurgy for some time now and have not had a great deal of Mojo happening so yesterday my son and his family went to Dream World and White Water World and I tagged along with them. All in all we had a fabulous fun filled day. I actually went on these rides! 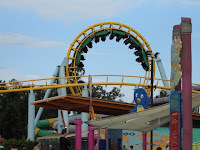 The Corkscrew was the very first ride we went on in the morning. If you can pick which one is me hanging upside down on the left then you will get the prize! After the Corkscrew we went on the Rapids and I must admit I did love it as I did last time we came here. We walked through to White Water World and had a beautiful picnic lunch that Ann had prepared, and then it was back to the rides again. The other ride I went on that I thought I would be terrified on was what was called the Green Room. It was a series of long tunnels heading downward, and then at the end of the tunnel you were spat very unceremoniously into this huge funnel which tossed you from side to side and then out into the open. It was such brilliant fun and we all slept extremely well last night. Now I have it figured that if I went there everyday and climbed all the stairs and steps then I would be waif like in no time at all! I must admit I feel rejuvinated so I will be posting some of my creations from the last week or so. Bye for now.